After purchasing a new set of dies from Forster, Hornady, Redding, or Whidden Gunworks, you’ll want to disassemble the dies, inspect then, and then remove the internal grease and/or waxy coatings placed on the dies by the manufacturer. Here are two video that show how to de-grease and clean dies as they come “out of the box” from the manufacturer. In the first video, from Creedmoor Sports, Bill Gravatt shows various methods for cleaning dies both when new and after they have accumulated carbon and lube after use. This video is definitely worth watching. 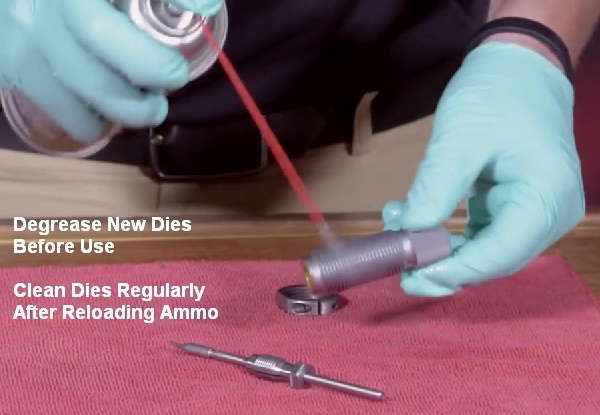 In the second video, a Hornady technician shows the method for degreasing dies before first use. A convenient aerosol spray cleaner is used in the video. You an also use a liquid solvent with soft nylon brush, and cotton patches. NOTE: After cleaning you may want to apply a light grease to the external threads of your dies. These same techniques work for cleaning dies after they have been used for reloading. Many otherwise smart hand-loaders forget to clean the inside of their dies, allowing old case lube, gunk, carbon residue, and other contaminants to build up inside the die. You should clean your dies fairly often, particularly if you do not tumble or ultrasound your cases between loadings. It is most important to keep full-length sizing and body dies clean. These dies accumulate lube and carbon residue quickly. Share the post "How to Properly Clean Your Reloading Dies"
We call them “black rifles”, but that shouldn’t refer to all the carbon and gunk on the inside. AR-platform rifles can be maintenance-intensive beasts. But some AR owners make the situation worse by not regularly cleaning important small parts, or by using too much oily/greasy lubricants in the wrong places. A properly maintained and lubricated AR15 can shoot hundreds of rounds (between cleanings) without a problem. If you learn where (and where not) to apply lubricant, you’ll find that your AR will run more reliably and the task of cleaning the bolt and bolt carrier will be less of a burden. Share the post "How to Clean and Maintain AR-Platform Modern Sporting Rifles"
Share the post "Black Rifle Maintenance — AR15 Cleaning How-To Videos"
One of our Forum readers complained that his 6mm jags fit very tight with patches, making it difficult to apply much solvent. The problem with a tight-fitting patch is that the solvent gets squeezed off in the first few inches. You can switch to a smaller jag, or a bore mop, but there is an even better way to get an ample amount of solvent in your bore — just spray it in with a “wash bottle”. This is an inexpensive plastic bottle with an L-shaped dispensing neck, tapered at the end. You can either just plug the breech and spray from the muzzle end (where most copper fouling is), or, alternately, put the wash bottle neck directly in the chamber and spray forward. When spraying from the chamber forward, you may need to use a rubber O-Ring to seal off the action… depending on the bore size and the particular wash bottle’s neck spout diameter. Using wet patches or wet brushes is an inefficient way to really saturate the tight bores of 17s, 20s, and 22s. Even with a cotton bore mop, most of the solvent will be squeezed out before it gets to the end of the bore, where most copper fouling occurs. For these smaller 17, 20, and 22-caliber bores, you can just take the “wash bottle” and stick the tapered nozzle right in the chamber. The tapered end will press fit in the throat, sealing off the chamber. With the barrel slightly nose-down, give the bottle a couple good squirts until the solvent mists out the muzzle. In just a few seconds, this will put more solvent in the bore than a half-dozen wet patches. A solvent-filled wash bottle is also handy for wetting your brushes. It’s much easier to saturate a bore brush (without spilling solvent on your stock), by using the wash bottle. You can get wash bottles from USPlastic.com, Amazon.com, or lab supply stores. Share the post "Tech Tip: Wash Bottles Speed Barrel Cleaning"
Editor: This article appears on the Criterion Barrels website. It provides good, conservative advice about barrel cleaning. Understand that cleaning methods may need to be adapted to fit the amount and type of fouling (and the particular barrel). In general, we do try to minimize brushing, and we follow the procedures Criterion recommends respecting the crown/muzzle. We have also had very good success using wet patches followed by Wipe-Out bore foam. Along with the practices outlined by Criterion below, you may want to try Wipe-Out foam. Just be sure to use a fitted cleaning rod bore guide, to keep foam out of the action recesses and trigger assembly. 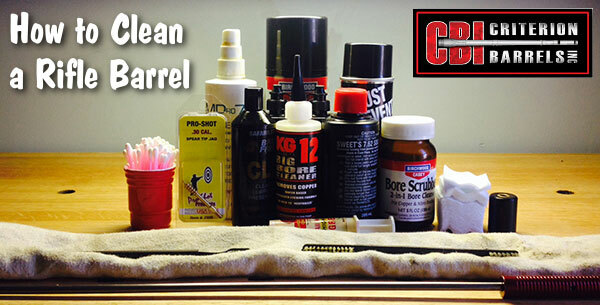 Share the post "Rifle Barrel Cleaning 101 — The Criterion Way"
It’s December already. That means winter has definitely arrived — no doubt about it. If you plan to put away all or some of your firearms for the winter, here are TEN Tips for winterizing your firearms. 1. Bore Cleaning and Coating — Clean your barrels and neutralize any solvents you may have used. Then run a couple patches with a corrosion-fighter down the bore. We recommend Eezox or CorrosionX. Eezox leaves a glossy dry film shield with excellent rust resistance. CorrosionX is more like a conventional oil, but with special anti-rust additives. Other products may work well too. Just be wary of the “all in one” products that have a strong solvent, and don’t use any fluid that contains ammonia — this can actually promote corrosion. Here’s a test of various anti-corrosion products: Rust Block Comparison Test. 2. Crown Inspections — After cleaning the barrel, inspect the crown with a magnifying glass. If you see any unusual wear, abrasion, or “shark’s teeth” at the very outer edge of the rifling, make a note — it may be wise to recrown the barrel next spring. Before you place your rifle in the safe, we recommend putting a piece of electrical tape or blue masking tape loosely over the muzzle to protect the crown. This is just to protect the delicate crown during handling — you are NOT trying to seal off the bore. 3. Optics Storage — If your gunsafe is crowded, you may wish to remove the optics and rings from your rifles before winter storage. You can use a white crayon to mark the ring position (on the rail) for next season. We recommend that you store your optics inside a warm part of your house, where temperatures and humidity are relatively stable. 4. Trigger Group — Inspect your trigger assembly. Trigger housings accumulate dirt, grit, and oily gunk over the course of a season. If you have some basic mechanical skills, you may wish to remove the trigger from the hanger and clean it per the manufacturer’s recommendations. Don’t flood it with any kind of thick oil. 5. Bolt and Action — Clean the gunk off your bolt and raceway in your receiver. Put a thin coat of anti-corrosion product on the bolt, and re-grease the lugs and camming surfaces as recommended by the manufacturer. Don’t forget the fasteners and pins on the action and scope rail — these may not be stainless even if you have a stainless steel receiver. 6. Use Thin Gloves — When oiling firearms during the winterization process, we recommend you wear thin latex or nitrile gloves. This will prevent you from leaving skin oils and acids that can actually promote corrosion. This will also protect YOU from any chemicals in the corrosion-blockers you put on your guns. 7. Applying Surface Protectants — For blued firearms, put Eesox or other rust-fighter on a cloth and wipe the barrel and exposed metal. Eezox works best with a couple light coats. Don’t forget iron sights, bottom metal, trigger guards, bolt handles, and sling swivels — they can rust too if not protected. Use Q-Tips or small swabs to reach small, internal parts. 8. Use Gun Sacks — We put rifles and pistols in Bore-Store Gun sleeves. These thick, synthetic-fleece sacks cushion your guns, preventing nicks and scratches. The breathable fabric wicks away moisture, and the fibers are coated with corrosion inhibitors to help fight rust. Bore-Stores are offered in a wide range of sizes, so you can find something to fit everything from a Snub-nosed revolver to a 32″-barrelled 50 BMG. Rifle-size Bore Stores can be purchased for $9.00 – $22.00 from Brownells.com or Amazon.com. While we prefer Bore-Stores for regularly-used guns, if you have heirloom firearms that will be kept in storage for very long periods without seeing any use, you may want to grease them up and place them in the thin, but rugged three-layer storage bags sold by Brownells. Here’s one VITAL bit of advice for using these bags. Be absolutely sure, before you seal up the bags, that your guns are DRY and that all metal surfaces have been coated with an effective rust-blocker, such as BoeShield T9 or Eezox. 9. Take Your Guns OUT of Foam-lined Cases — These common foam-lined cases are Rust Magnets. This may be the most important Tip in this article. Just about the worst thing you can do in the winter (short of leaving your rifle outside in the rain) is to store firearms in tight, foam-padded cases. The foam in these cases actually collects and retains moisture from the air, acting as the perfect breeding ground for rust. Remember, those plastic-shelled cases with foam interiors are for transport, not for long-term storage. 10. Make Your Gun Safe Ready for Winter — If you don’t have a Goldenrod (or equivalent), buy one. Sold as a “dehumidifier”, the Goldenrod is a simple electrical element that can maintain temperature in your gun vault. This helps prevent moisture in the air from condensing on your guns. A small incandescent light-bulb can help as well (just make sure it cannot touch any flammable fabrics or objects). In addition, you may want to purchase Dessicant packs to put inside the safe to absorb moisture. If you have an electronic keypad for your safe, we recommend replacing the batteries at least once a year. Share the post "TEN TIPS for Winter Firearms Storage"
Ask 10 shooters about barrel cleaning and you’ll get 10 different opinions. This reflects that fact that different fouling problems demand different solutions. For example, solvents that work well for copper may not be the best for hard carbon (and vice-versa). To come up with the right solution, first you must understand the nature of the fouling in your barrel. Chip Lohman, former Editor of Shooting Sports USA Magazine, has authored an excellent article on barrel maintenance and cleaning. Chip’s article, Let the BARREL Tell You — Match Barrel Care, can be found in the Shooting Sports USA digital archives. In this article, Chip shares the knowledge of a dozen experts including barrel-makers Frank Green (Bartlein Barrels), John Krieger (Krieger Barrels), and Tim North (Broughton Barrels). CLICK HERE to read Full Match Barrel Care Article. After listening to folks who shoot, build barrels or manufacture cleaning solvents for a living, we concluded that even the experts each have their own unique recommendations on how to care for a match barrel. But they all agree on one thing — the gun will tell you what it likes best. Because the life expectancy of a match barrel is about 1,500 to 2,500 rounds, the objectives of cleaning one should include: preserve accuracy, slow the erosion, and remove fouling — all without damaging the gun. This article doesn’t claim that one cleaning method is better than the next. Rather, we set out to interject a little science into the discussion and to share some lessons learned from experts in the field. For more Shooting Sports USA articles, visit www.ssusa.org. Share the post "Barrel Care and Maintenance — Expert Advice"
The U.S. Patent Office has awarded BoreSmith utility patents for two unique gun cleaning products. Patents were issued for BoreSmith’s triangular Pyramid Patch™ as well as BoreSmith’s dual-diameter JagBrush™. Both products were designed by Shane Smith, a mathematician/physicist who used his scientific and firearms knowledge to create innovative bore-cleaning products that may well work better than conventional patches and brushes. BoreSmith’s clever Triangle Patch™ (aka Pyramid Patch) presents more cleaning surface area to the bore wall than does a conventional square or round patch (of equivalent size). At the same time, the unique geometry makes Triangle Patches much less likely to jam in the barrel. This is because the notches in the sides of the triangle allow the patch to sit more uniformly on the jag (without bunching up). The Triangle patch can be used with a standard jag but works best when paired with BoreSmith’s patented dual-diameter JagBrush. Order Triangle Patches HERE. NOTE: Despite what you may see in this video, you should insert brushes and patches from the chamber end first, using a well-fitting cleaning rod bore guide. With bolt-action rifles, NEVER insert a cleaning rod (with brush or jag) in through the muzzle. This may damage the delicate crown of your barrel. The JagBrush is like a standard bore brush but has two different diameters on the bristle section. Bristles in the front are smaller, while the rear bristles are similar length to a standard bore brush. When a patch is pushed through the bore using a JagBrush, the smaller bristles will grab the patch, leaving the longer bristles exposed and creating a dual-­action wiping + brushing system. JagBrushes are offered in a wide variety of calibers, in both bronze and nylon versions. Shane Smith, CEO of BoreSmith, was pleased that his designs have been awarded two important patents: “I created these tools to allow the user to get their firearms cleaner, faster, and without causing unnecessary damage in the process. At BoreSmith, we strive to develop and produce superior cleaning tools that help firearm owners protect their investments.” For more info, visit BoreSmith at RigelProducts.com. Share the post "BoreSmith Patents Triangular Patches and Dual-Diameter Brushes"
Among the many range boxes available, the MTM model RBMC Range Box leads the pack in terms of versatility. It is rugged, it has plenty of storage space, plus it doubles as a handy cleaning station. This Editor has used the MTM Range Box to clean rifles and as a “range expedient” rifle holder when adjusting scopes and tensioning action screws. It’s a good product that does the job and stands up to rough handling. The key feature setting MTM’s RBMC apart from most range boxes is the rubber-coated cradle system. Wide enough to fit a 3″-wide fore-arm, the cradles slide into vertical slots on either end of the box. This allows your range box to serve as a stable maintenance station. The RBMC is really pretty stable in this role, and the cradles won’t mark your stock. The cradles even feature slots on each side to hold your cleaning rods when not in use. The MTM Range Box is secure enough to stay in place when you’re brushing the barrel. However, if you’re working on a carpeted bench top, you may want to keep one hand on the box when running a cleaning rod through the bore, just to ensure the box doesn’t slide. Though we really like the MTM Range Box, it’s not perfect. First, we wish the box was a bit deeper, to have added carrying capacity. The dimensions of the MTM Range Box are: 25″ long x 11.5″ wide x 8.75″ high. We’d like to see it 12″ high/deep to allow larger solvent bottles to stand upright and to provide more space to carry tools and shooting muffs. However, it is deep enough to hold the large 100-round MTM cartridge boxes that are popular with many shooters (see photo at left). The cradles are very nicely designed, and will hold your rifle securely without marking the stock. However, we’ve found that sometimes the rear cradle grips the gun so well that the cradle slides out as you lift the gun up. This is not a big deal, but it does demand a little extra attention when you’ve finished cleaning. We really like the twin clear plastic dividers that fit into the large removable top-tray, but we wish the dividers had individual hinged tops. This would keep patches and small parts more secure. The MTM Range Box costs about $46.00 at most vendors. The MTM Shooting Range Box RBMC-11 (green version) is on sale now for $35.68 at Amazon.com, with FREE shipping. The red RBMC-30 version (shown below) costs slightly more, and may currently be hard to find. Share the post "Gear Review: Range Box with Gun Cradle from MTM"
Ultrasonic Case Cleaning — What’s the Optimal Dwell Time? If you’ve read our feature story on Ultrasonic Cleaning by Jason Baney, you’ve seen the remarkable results that can be achieved with this method. Ultrasonic cleaning has many advantages over traditional tumbling methods of case cleaning. There is no dust or media residue to remove from the brass, and when done right, the cases come out clean and shiney, inside and out, even the primer pockets. In its Benchtalk Archives, Brownell’s has an excellent article discussing Ultrasonic Case Cleaning. Brownell’s staff compares results, with measured dwell times from 5 to 75 minutes, using both Mpro-7 and HCS 200 cleaning solutions. Tests are performed with once-fired and 5X-fired Tactical 20 (Tac20) cases, as well as once-fired .260 Rem Cases. The article also compares the results from ultrasonic cleaning vs. tumbling in walnut media. Below are Brownell’s results for Tac20 cases with the HCS 200 (non-acidic solution). Go to Brownell’s article for MPro7 results and Rem 260 results. Procedure — Solution was de-gassed for 15 minutes, then 63 Tac20 cases were placed in a single layer, in stainless steel mesh basket. The temperature of the starting solution was 102° F. When the cases were removed the temperature was 110° F.
5 minutes: The exterior of the cases are not significantly brighter/cleaner. The primer pockets and case interiors are still dirty. 10 minutes: Exterior of the cases are brighter. 70% of the cases show some degree of cleaning of the primer pockets. Little difference seen inside the case, but case mouths are cleaner. 15 minutes: Case brightness is about the same. Still only 70% of the primer pockets are clean, but a larger portion of each is cleaner. A Q-tip swabbed inside the cases shows that carbon/powder residues are loosening up. 20 minutes: Case exteriors are brightening up. 80-85% of the primer pockets are about 90% clean. The insides of the cases and case mouths are cleaner. 25 minutes: Cases are brighter/cleaner than even new brass. 80-85% of the cases have almost completely clean primer pockets. The inside of the cases are 80-90% clean. 30 minutes: The insides of the cases and case mouths appear to be completely clean. 87% of the primer pockets are virtually 100% clean. 13% of the cases had stubborn primer pocket residue that could not be completely removed. 60 minutes: Eight cases (13%) were placed in the tank for another 30 minutes to try to remove the remaining residue in their primer pockets. Six out of the eight cases were completely clean. 30 minutes: Based on the above observations, I didn’t begin to observe these 5-time fired cases until after 30 minutes: The exterior cases are bright/clean. Brighter than new cases. The primer pockets on 75% of the cases are 75% clean. The remaining cases had primer pockets that were only 25% clean. The inside of the cases appear to be clean. 65 minutes: 25% of the primer pockets were 95% clean, 25% of the primer pockets were 90% clean, 25% of the primer pockets were 85% clean; and 25% were 80% clean. 75 minutes: 75% of the primer pockets were 90% clean. The Brownell’s article explains: “Ultrasonic cleaning uses high-frequency sound waves (generally between 20-80 kHz) to remove a variety of contaminants from objects immersed in a liquid. The result of these high-frequency sound waves is a process called cavitation. These high frequency bursts of ultrasonic energy produce a three-dimensional wave of alternating positive and negative pressure areas as the sound wave passes through the solution. During negative pressure, microscopic cavitation bubbles form and will continue to grown until they reach resonant size. As the positive sound wave passes, the pressure rises rapidly and implodes these tiny bubbles. Before these minuscule bubbles implode they store a tremendous amount of energy. These bubbles can be as hot as 10,000 degrees and have as much as 50,000 lbs per square inch of pressure. This sounds alarming, but you have to remember that these bubbles are microscopic in nature and pose no harm to anything, unless you are a carbon /powder residue deposit on a cartridge case! Photos and quotes © 2007-2010, Brownells®, Inc. All Rights Reserved, Used with Permission. Share the post "Ultrasonic Case Cleaning — What’s the Optimal Dwell Time?" Hornady has announced new products for 2013. These include a number of new bullets, along with new loaded rifle, pistol, and shotgun ammunition. Perhaps most interesting for precision reloaders is Hornady’s new jumbo Ultrasonic Cleaning machine (MSRP $658.33). Featuring a 9-liter capacity, the new Hornady Hot Tub™ is long enough to accommodate and clean a 16-inch AR-15 upper. Along with its large capacity, the Hot Tub has many advanced features. For 2013, Hornady will be offering a new, jumbo-sized ultra-sonic cleaning machine that can handle big parts and accessories. In addition to having four (4) transducers, there is also a heating element that enhances cleaning action. Hornady says that “the microjet action of the Hornady® Hot Tub™ removes carbon residue and other debris from cartridge cases, gun parts and other metal equipment.” We know that ultra-sonic cleaning works well on cartridge cases, provided you have a good machine, a suitable solution, and run the machine for an appropriate time. The new Hot Tub is well-equipped out of the box. One 1.7 quart inner tank comes with the unit and can be used in the main tank for cleaning multiple smaller batches or to use separate solutions at the same time. Additional inner tanks can be purchased separately. Hanging cords have been integrated into the design to allow large objects to take full advantage of the ultrasonic energy. Additionally, the Hot Tub® features integrated drain pans in the lids, a small parts basket, a degas function and five (5) temperature settings from 100-140°F. Share the post "New Hot Tub™ Ultra-Sonic Cleaning Machine from Hornady"
Benchrest shooter Bill Gammon offers a nice product that helps prevent solvents and oils from marring the finish of a fine wood stock, or a painted fiberglass stock. The STOKBOOT also prevents solvents from softening the bedding, while guarding against nicks and scratches. Gammon’s STOKBOOT fits over the rifle stock during cleaning of the barrel. The quilt on the outside soaks up the solvent before it reaches the stock and holds it until it evaporates. A twin layer of vinyl on the inside stops any solvents from getting through, but Gammon cautions that you should not leave the STOKBOOT on overnight, because solvents could soak through. The basic colors are Red, Wine, Black, Blue, and Green. Typical retail price is about $17.00. Gammon sells wholesale only. His STOKBOOTs are available through popular retail vendors including: Accuracy Arms, Borden Rifles, Bruno Shooters Supply, Russ Haydon’s Shooters’ Supply, Sinclair International. European dealers are: Reloading Solutions (UK), and Heinz Henke (Germany). Share the post "STOKBOOT Shields Stock from Solvents and Scratches"
In 2011, Hornady will be offering a new stainless-shell, heavy-duty Ultrasonic Cleaning machine, which fits nicely between the cheap, low-capacity machines sold on eBay, and the large industrial machines which can cost $1000.00 or more. Hornady’s new Lock-N-Load® Magnum Sonic Cleaner™, with a $317.08 MSRP, provides triple the size and twice the power of the original Lock-N-Load® Sonic Cleaner™. The new machine, priced at $317.08 MSRP, features two transducers. This assuredly will improve cleaning performance and probably reduce processing time, compared to single-transducer machines in the same size range. The new Magnum Sonic Cleaner also has a heat-setting control, allowing users to set the correct temperature for best cleaning efficiency. Cheaper machines just have an “on/off” switch. The new machine comes standard with a durable metal-mesh basket. Tank dimensions: 9.4″ x 5.5″ x 3.9″. Share the post "New, Dual-Transducer Ultrasonic Machine from Hornady"